A report suggests Moore could request for a trade or sit out the 2019 season. That could change everything for the WNBA. 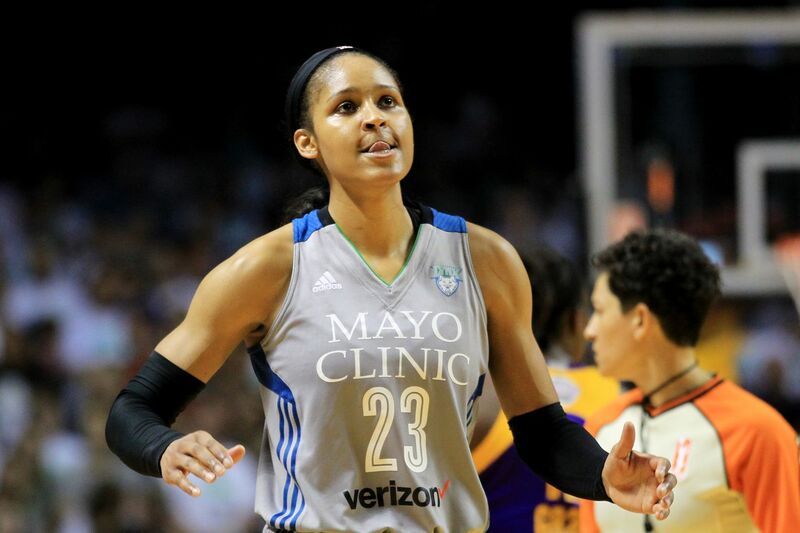 WNBA superstar Maya Moore and the Minnesota Lynx are having some form of a standoff, the nature of which isn’t clear just yet. WCCO’s Mike Max first broke the news that the 29-year-old Moore might retire, take a year off or ask to be traded. (Retiring seems highly unlikely). Something is definitely up. Representation for Moore did not immediately respond to SB Nation’s request for comment. The whole league is on edge as one of the league’s best talents could be on the market. Moore, a four-time champion and former MVP, is arguably the league’s most accomplished player. New York Liberty “Core’d” their superstar Tina Charles in the same fashion this offseason. It’s similar to the NFL’s franchise tag, but even more punitive. The distinction can be placed up to four times on the same player throughout their careers, which is why there’s very little superstar player movement in the WNBA. If a star is drafted to a team, she’s likely to stay for four seasons under the league’s rookie-scale contracts, and even if she’s unhappy, a team can use the “core” provision on her for four additional seasons. Though a team can only “core” one player at a time, the effect is that a superstar like Moore may not be able to hit the open market until they reach their 30s. Sometimes, the only way for a disgruntled star to change teams before then is to threaten to sit the season out. Moore’s MVP Lynx teammate, Sylvia Fowles, sat half of the 2015 season for the Chicago Sky after she was “core’d.” She eventually was traded to Minnesota, prolonging the Lynx’s dynasty. Does this mean Moore is angling for a trade like Fowles did? Nothing is clear yet, but the unrest between Moore and the Lynx could to be a setup should she opt to force her way out before the season starts. It’s safe to infer things aren’t all rosy between Moore and the Lynx, or else the team would’ve used its core designation on another player. The “core” tag would make more sense on Moore’s teammate, Seimone Augustus, for example, as the 34-year-old may get a bigger offer from a team with more cap space. But if Minnesota sensed Moore might leave the franchise in the offseason, using the “core” distinction would make sense to force her back to the team. At the very least, if the sides can’t agree, the Lynx can trade Moore and not lose her for nothing. Does this “core” affect Moore’s salary? No. Moore will command a maximum deal wherever she goes. or the 2019 season, the maximum salary is $115,000. Even if she is “core’d,” Moore can negotiate for any salary and any length of contract with the Lynx, though most players under this designation tend to sign one-year deals. All the core designation does is limit where a player can sign, not how much. Could this be the end of the Lynx as we know them? Even prior to this dispute, it was unclear how the league’s greatest dynasty will put itself back on the map. The Lynx had the most stacked starting lineup in the WNBA for nearly a decade, winning four of seven championships from 2011 to 2017. But these Lynx aren’t those Lynx, as we learned from last season’s disappointing first-round playoff loss. Point guard Lindsay Whalen retired after the year, and forward Rebekkah Brunson and Seimone Augustus are falling out of their prime years. Fowles was her star self, but Moore had a down season. The team needs to adapt, and Minnesota knows it. A young, modernized Seattle Storm offense took the league over in 2018, and they’re considered favorites to repeat behind 24-year-old MVP Breanna Stewart. Reeve reiterated that sentiment to SB Nation in September while serving as an assistant coach with Team USA. It’s unclear how this is sitting with Moore, who has never played on a Lynx roster without Augustus, Brunson, or Whalen. How big would a Moore trade be? Moore is one of the biggest stars in league history, both in terms of play and popularity. She led the league in fan All-Star votes last season, won the MVP award in 2014, and has four WNBA championships. Should she be dealt, it would arguably be the biggest trade in league history, rivaling Elena Delle Donne’s move to the Mystics in 2017. If the Moore situation plays out in any other way than the star staying in Minnesota and playing out the 2019 season, it’ll be the biggest storyline of the year. That’s important as the WNBPA and league begin discussions on a new Collective Bargaining Agreement, which would take effect in 2020. The sides opted out of their current CBA in October. It’s no secret players aren’t happy with the core designation, as it limits their freedom to choose the city they want to live and work in. The absence of Moore, arguably the league’s most well-known player, for even part of the season would add to the players’ leverage in CBA talks. In addition, should Moore force a trade to a competitor, the drama may draw more attention to the league, much like trade rumors have increased interest in the NBA. If so, the players can make an even more compelling case against the core designation and for legislation that promotes, or at least enables, player movement in the offseason. But we have a lot to learn about what’s really happening in Minnesota before we get here. How likely is it for Moore to miss the 2019 season? Until the details of the sides’ rift surface, it’s hard to know. But stars have missed seasons before, whether for health reasons or for trade demands. Fowles refused to play for half a season until she was moved to Minnesota. Diana Taurasi missed the entire 2015 after her Russian pro team for the winter offered to pay what she would’ve made in the WNBA to rest. It’s possible Moore could give her body an entire year’s rest if she’s that unhappy with the situation. It’s a threat that could benefit her in multiple ways, and convince Minnesota to let her go.